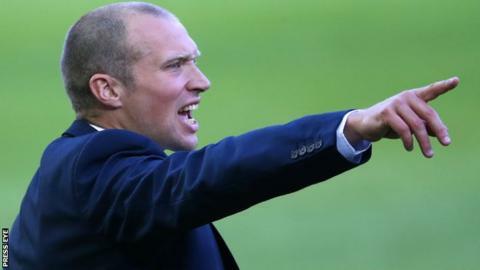 Linfield manager Warren Feeney could be set to leave the Windsor Park club to take up an assistant's role at League Two club Newport County. Newport are understood to have made an approach to Linfield asking for permission to speak to Feeney. The Welsh side parted company with manager Terry Butcher on Thursday and former Plymouth boss John Sheridan has been appointed as his successor. Feeney, who won 46 Northern Ireland caps, has guided Linfield to the top of the Irish Premiership this season, with the Blues current four points clear of champions Crusaders. On Friday morning, the Belfast man declined to comment on his potential move away from the Irish League. Former Plymouth striker Feeney was appointed Blues boss in 2014. Ex-Republic of Ireland international Sheridan left his role as Plymouth boss last season where he worked with current County chief executive Jason Turner.